We want to be your single source for value added machining and fabrication services for complete turnkey operations. 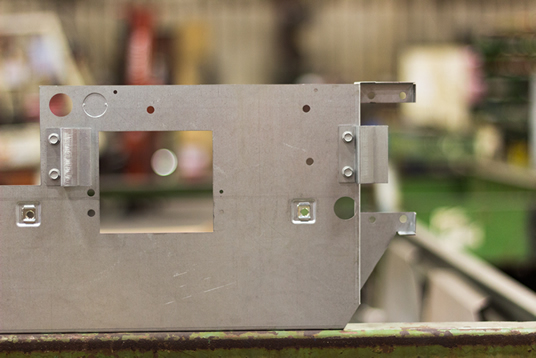 We provide complete contract manufacturing services for sheet-metal goods from engineering to CNC services, to cutting and bending, to welding and painting, to kitting and shipping. Whatever your project scope we can promptly complete your product and have it shipped to you on your time schedule. Matthews Industries has been in existence since 1949 and is a family-owned company. Manufacturing space currently comprises 100,000 square feet. ``SolidWorks`` solutions enable us to quickly transform new ideas into great products. It also enables us to use a common data model to create complete, accurate designs that can be leveraged across planning, equipment design, layout, fabrication and construction. ``MetaCAM`` offers a consistent user interface and seamless integration of all modules enabling us to catalyze high productivity and shorten the learning curve in diverse industrial sectors. Metamation has made a quantum leap in simplifying and speeding up operations with intelligent automation. Matthews Industries is focused on constant improvement of efficiencies via hands-on support of the factory floor. Matthews Industries utilizes CNC Vertical Machining Center equipment with bed travel of 20`` X 40``. Two CNC 16`` lathes with up to 3 axis capability as well as boring mills are used to meet customer requirements. Matthews Industries uses multiple lasers with processing capabilities for 5'X10' sheets in thicknesses of up to 3/4`` mild steel, 1/2`` stainless, and 3/8`` aluminum. We utilize four Amada CNC turret punches with bed travels up to 60`` x 72`` without re-positioning, and one Trumph TruPunch are capable of punching up to 1/4`` plate. We can process steel with bed size requirements as large as 48`` x 96`` and a capacity of up to 250 tons. Seven Amada programmable press brakes with bed lengths up to 144`` and capacities from 50 to 440 tons can handle a wide range of customer jobs. Our mechanical press brakes to 300 tons. We work with aluminim, carbon steel and stainless and have the ability to MIG, TIG, resistance, and manual arc weld. We offer turnkey production in mechanical, electrical, and HVAC assemblies. Testing services are also provided. At Matthews Industries, we strive to provide excellence of product as well as process. We offer sub-assemblies and complete unit build. We can handle your component building needs for wiring kits, and accessories, and fan coils. Extensive support equipment includes 5-ton overhead cranes, water treatment facility, etc. We offer sharp-edge free & cosmetic finishing including glass bead blasting. We provide continuous-surface pretreatment of galvanized, aluminum and mild steel. We are also equipped with a conveyor line for powder coating and bake operation for galvanized, steel, aluminum and other surfaces.